Under the Soviet system, four forms of ownership existed: state, communal/social, trade union and personal. Legal entities were state-owned and centrally-controlled. It became apparent that in order to restructure the economy, it was necessary to transfer as many enterprises as possible to private ownership. To this end, privatisation has been conducted by attracting strategic investors in key industries of the economy, often by conducting investment tenders. To encourage market reforms, a Civil Code of the Russian Federation was adopted which integrates various legal forms of market-oriented entities. 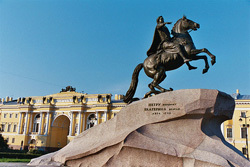 As a result of adopting the Civil Code, Russia has seen swift growth in the number of newly-established legal entities. The first part of the Civil Code provides an exhaustive list of legal forms of commercial entities. They are as follows: general partnerships, limited partnerships, limited liability companies, additional liability companies, open and closed joint stock companies, production co-operatives and unitary enterprises. An individual may engage in entrepreneurial activity without establishing a legal entity once he is registered with the state registration authorities as an individual entrepreneur. Individual entrepreneurs include heads of farms that operate without having formed legal entities, once such farms have undergone state registration. Individual entrepreneurial activity carried out without the formation of a legal entity is subject to the regulations applicable to commercial legal entities, unless otherwise implied by legislation, other legal regulations or the nature of the legal relationship. An individual engaged in individual entrepreneurial activity who has not established a legal entity and who is not registered as an entrepreneur may not refer to the lack of his entrepreneurial status with regard to agreements he has concluded. An individual entrepreneur is liable for his obligations with all his property, except that which may not be seized under current legislation. Representative offices and branches are separate subdivisions of legal entities, situated away from the place of the head office. A representative office represents and defends the interests of the legal entity. Besides executing the functions of a representative office, a branch also performs other functions of the legal entity. Representative offices and branches of Russian companies are not subject to state registration. Representative offices and branches of foreign legal entities acquire their status by undergoing an accreditation procedure. A foreign legal entity should be registered with both the tax authorities and the non-budgetary funds, as well as with the statistics authorities at the location of its representative office or branch. The management of an accredited branch of a foreign legal entity must file an annual report on its activities with the State Registration Chamber of the Ministry of Justice of the Russian Federation. The activities of representative offices of foreign legal entities in the Russian Federation (previously in the USSR) used to be rather limited. Representative offices could perform economic activities in the Russian Federation only to fulfill specific contracts. The activities of representative offices of foreign legal entities are still regulated by Decision of the Council of Ministers of the USSR #1074 of 30 November 1989 to the extent that the provisions thereof do not contradict current statutory legislation. However, the restrictions established by the above Decision with regard to the activity of representative offices of foreign legal entities are not valid at present. Every six months the head of a representative office must submit information on the representative office's activities to the State Registration Chamber. • acquiring enterprises, assets, shares, bonds or other securities which, in accordance with Russian legislation, may be sold to foreign investors. To conduct business activities in which the company is managed by one or several entities or individuals, the legal forms most widely used in the Russian Federation are a limited liability company and a joint stock company. • The number of shareholders may not exceed 50. If this limit is exceeded, the LLC should be reorganised into an open joint stock company or a production co-operative. • The minimum amount of the charter (share) capital of an LLC, e.g. which is fully or partly managed by foreign investors, must be 100 minimum monthly wages (RUB 10,000 as of 01 April 2009). Contributions to the share capital of an LLC may be made in monetary or non-monetary form (e.g. securities, property rights). • An LLC's charter (share) capital consists of the nominal value of its shareholders' shares, which is stipulated by the constituent documents. All shareholders must make a contribution to the charter (share) capital. • The shareholders of an LLC are not liable for company debts and they risk losses only to the extent of their charter (share) capital contributions. • If the net assets of an LLC are less than the charter (share) capital as at the end of the second financial year and every year thereafter, the LLC is obliged to reduce its charter (share) capital to an amount not exceeding its net asset value. The LLC is subject to liquidation if its net asset value as at the end of the second and every subsequent financial year is less than the minimum charter (share) capital established by statutory legislation as at the date of state registration of the LLC. • The supreme body of an LLC is the General Shareholders' Meeting. An LLC may (but does not have to) create a Board of Directors. In addition, the General Shareholders' Meeting elects the general director who acts as the LLC's executive body, manages the LLC and reports to the General Shareholders' Meeting. • A shareholder of an LLC has the right to sell or otherwise cede its share to one or more shareholders. Cession of a share to any third party is allowed unless it is prohibited by the Charter of the LLC. If the Charter does not allow a shareholder to sell its share to a third party, and no current shareholders want to purchase the share, the LLC is obliged to purchase the share at its actual value as requested by the shareholder, or reimburse its value in kind with the shareholder's consent. • A LLC may not have a one-person company as its sole shareholder. It should be noted that in accordance with Federal Law #312-FZ of 30 December 2008 regulation of the procedure for establishing an LLC and its operations will be significantly changed as of 01 July 2009. The main legal act regulating the activities of joint stock companies established in the Russian Federation is the Federal Law 'On Joint Stock Companies' #208-FZ of 26 December 1995. According to the Federal Law 'On Joint Stock Companies', joint stock companies may be open (OAO) or closed (ZAO). The main legal differences between a closed and an open JSC are the procedures for placing and alienating shares. Shares issued by a closed JSC are placed only among persons known in advance (private placement), whereas an open JSC has the right to both publicly offer and privately place its shares. Furthermore, shareholders of both closed and open JSCs may alienate their shares without the consent of other shareholders or the company. However, shareholders of a closed JSC have a pre-emptive right to buy the company's shares which are sold by other shareholders, whereas shareholders of an open JSC do not have such a right. Other differences between open and closed JSCs also exist. Open and closed JSCs are legal entities which act on the basis of the Charter approved by their founders. Both have unlimited duration unless otherwise stipulated by the Charter. Shareholders of open and closed JSCs are not liable for the company's debts and risk losses only to the extent of the value of their shares. The number of shareholders in an open JSC is unlimited. The number of shareholders in a closed JSC may not exceed 50. Otherwise a closed JSC must be reorganised into an open JSC. The supreme governing body of JSCs of both types is the General Shareholders' Meeting. The exclusive authority of the General Shareholders' Meeting includes taking decisions on amending the Charter, approving the annual report and annual financial statements, taking reorganisation or liquidation decisions, as well as electing the Board of Directors of the JSC. The number of members of the Board of Directors is established by the Charter or the General Shareholders' Meeting, but cannot consist of less than five members. In an open JSC with more than 1,000 holders of voting shares, the Board of Directors should include at least seven members and in an open JSC with more than 10,000 holders of voting shares, at least nine members. The Board of Directors is elected by cumulative voting for the period until the following annual General Shareholders' Meeting. The Charter of a JSC with less than 50 holders of voting shares may stipulate that the functions of the Board of Directors be performed by the General Shareholders' Meeting. Either the General Shareholders' Meeting or the Board of Directors, if so authorised by the Charter, appoints a General Director (Director) who acts as the JSC's executive body, manages its current activities and has the right to act on the company's behalf without a power of attorney. The minimum charter (share) capital of a closed JSC is 100 minimum monthly wages and 1,000 minimum monthly wages for an open JSC (as of 01 April 2009, RUB 10,000 and RUB 100,000 respectively). A nonmonetary contribution can be made to the share capital. A JSC can issue both common and preferred shares. The par value of placed preferred shares may not exceed 25% of the share capital of a JSC. Fractional shares can be formed in a JSC. A fractional share grants the shareholder the rights provided by a share of the same category (type) to the extent corresponding to the fraction of a whole share which it constitutes. A JSC may take a decision to pay dividends based on the results of the first quarter, six months, nine months and (or) the financial year. A JSC may not have a sole shareholder which is a one-person business entity. Each common share of a JSC gives its owner the same set of rights. On the contrary, an LLC's constituent documents may stipulate that owners of equal shares in the charter (share) capital have different rights. As mentioned above, representative offices and branches of foreign legal entities become officially recognised by going through an accreditation process. Under Federal Law #160-FZ of 9 July 1999 'On Foreign Investment in the Russian Federation', branches of foreign legal entities should be accredited in accordance with the procedure established by the Government of the Russian Federation. In accordance with Resolution of the Government of the Russian Federation #1419 of 21 December 1999, branches of foreign companies must be accredited by the State Registration Chamber of the Ministry of Justice. Accreditation is currently carried out in accordance with the Temporary Provisions approved by the Order of the Ministry of Justice of 31 December 1999. To accredit its branch in the Russian Federation a foreign legal entity submits a set of documents to the State Registration Chamber. The list of necessary documents has been established by the Ministry of Justice. The Registration Chamber is authorised to request that additional information, not included in the abovementioned list, be provided about the activities of the foreign legal entity. The State Registration Chamber should complete the accreditation process within 30 days of receiving all the necessary documents from a foreign legal entity. The accreditation application may be denied if any of the necessary documents are not made available, or in certain specific cases stipulated by legislation. A branch is considered to be accredited once a relevant record has been made in the State Register of Branches of Foreign Companies Accredited in Russia, and once an accreditation certificate is issued. The accreditation period for branches may not exceed five years. Upon expiry of the accreditation period, the branch must discontinue its operations. If a foreign company files a written application including the necessary set of documents and the report on the branch's activities for the expired period of its accreditation at least 30 days before the accreditation period is to expire, the accreditation may be extended. The state duty for the accreditation of a branch of a foreign legal entity is RUB 60,000. In addition, the State Registration Chamber has established a fee for the accreditation of branches of foreign legal entities which ranges from USD 440 to USD 1,760, depending on the length of the accreditation period. Furthermore, an additional fee in the amount of USD 440 is charged to perform urgent (up to 7 business days) accreditation. The fees for accreditation of a representative office charged by the State Registration Chamber range from USD 880 to USD 2,200 depending on the length of the accreditation period. Please note, however, that the State Registration Chamber is solely responsible for maintaining the State Register of Representative Offices of Foreign Companies Accredited in the Russian Federation. Accreditation of representative offices is performed in Moscow by the State Registration Chamber, the Chamber of Industry and Commerce of the Russian Federation, the Federal Agency on Air Transport and a number of other authorities, for a period of one to three years with the possibility of extension. Federal Law #129-FZ of 8 August 2001, currently called 'On State Registration of Legal Entities and Individual Entrepreneurs', which came into force on 1 July 2002, established a procedure for state registration of legal entities when they are created, reorganised or liquidated, as well as when their incorporation documents are amended. The Law has unified the registration procedure for legal entities in the Russian Federation and established a policy of maintaining a uniform state register of legal entities. Under the Law, state registration of legal entities is performed within five days of filing all the necessary registration documents with the registration authority. Registration is performed by the regional department of the Federal Tax Service of the Russian Federation at the legal entity's location. One of the important innovations introduced by the Law is the fact that information included in the state register of legal entities will be made available to any person at his request. The state register of legal entities includes details of the charter (share) capital, the founders, the executive body's address, as well as other information and copies of constituent documents. In accordance with the amendments introduced by Federal Law #83-FZ of 2 July 2005 'On Amendments to Federal Law 'On State Registration of Legal Entities and Individual Entrepreneurs' and to article 49 of the Civil Code of the Russian Federation', the registration body (currently the Federal Tax Service) is granted the right to take a decision to remove a legal entity which has terminated its activity from the unified state register of legal entities. Such a decision may be taken when the following conditions are met simultaneously: within the 12 months preceding the date of the above decision, the respective legal entity failed to present reports stipulated by statutory legislation of the Russian Federation on taxes and levies and perform transactions with regard to at least one bank account. • the entity which contributed its shares and (or) property to the share capital is recorded in the register of parties as having a share market of particular goods of more than 35 percent. Moreover, a person who purchases shares in already existing Russian companies and acquires the right to dispose of more than 25% of the shares (or 1/3 of the share capital) is broadly speaking required to obtain the preliminary approval of the Federal Antimonopoly Service if, according to the most recent balance sheet, the aggregate value of assets of both the company and the buyer of the shares, as well as of the companies and entrepreneurs who are the buyer's related parties, exceeds RUB 3 billion, or if their total sales revenue for the last calendar year exceeds RUB 6 billion. It is also necessary to obtain the approval of, or notify the Federal Antimonopoly Service in a number of other cases stipulated by Russian legislation on competition. • in accordance with a decision of the court, if the legal entity commits severe or repeated legal violations or is declared bankrupt. Legal entities are liquidated by a liquidation committee appointed by the founders (shareholders) of the legal entity or a body which has taken a liquidation decision. When the liquidation process is completed, the founders (shareholders) of the legal entity obtain the part of the legal entity's property which is left after the creditors' claims have been satisfied. The bankruptcy procedure for legal entities is stipulated in Federal Law #127-FZ of 26 October 2002 'On Insolvency (Bankruptcy)'. In accordance with the Law, the debtor himself, the creditors, as well as authorised bodies are entitled to claim in court that the debtor be declared bankrupt. • amicable agreement (a bankruptcy-procedure applied at any stage of the bankruptcy proceedings in order to terminate the bankruptcy proceedings by reaching an agreement between the debtor and the creditors). The Law also stipulates a simplified bankruptcy procedure, which is applied to debtors who are either being liquidated or are absent.